LORLS v6 (aka LUMP + CLUMP) is now almost at a stage where we can consider going live with it here at Loughborough. Unfortunately we’re too late to launch at the start of the Summer vacation as we need time to fully advertise and train staff on the new system. That means we’ll probably launch the system at the start of the new academic year (October), Christmas or in time for the second semester (February 2011). We’re currently consulting with academic departments and library staff on when they’d prefer and are getting a strong steer that Christmas would be least disruptive for all concerned. In the meantime we’ll obviously continue to develop and test the system. Alongside this we’re looking to create a sandbox so that staff can play on (and learn about) the system before the official launch – whenever that will be. Had a really interesting meeting this afternoon with a couple of folk from Talis. Mark Bush, who is new to the company, contacted me a few weeks ago to arrange it. The purpose of the meeting was to gain greater understanding of different approaches to reading list management. Mark was accompanied by Ian Corns who despite his job title of “User Experience Champion” didn’t arrive wearing a cape or with his underpants over his clothes. The first part of the meeting turned into a show and tell: with me detailing the birth of LORLS and our ongoing project to redevelop the system, and Mark showing me a little of Aspire, Talis’ replacement for their existing Talis List product. The thing that struck me was how similar in concept their new solution is to what we’re doing with LORLS. 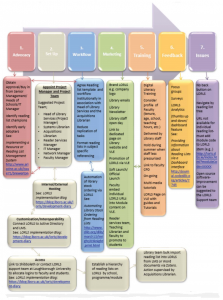 The second half of the meeting was given over to discussing the various possible strategies to use when implementing a reading list solution. Obviously selecting an appropriate system is important. However many of the key issues that will determine whether it is success are not necessarily system dependant. 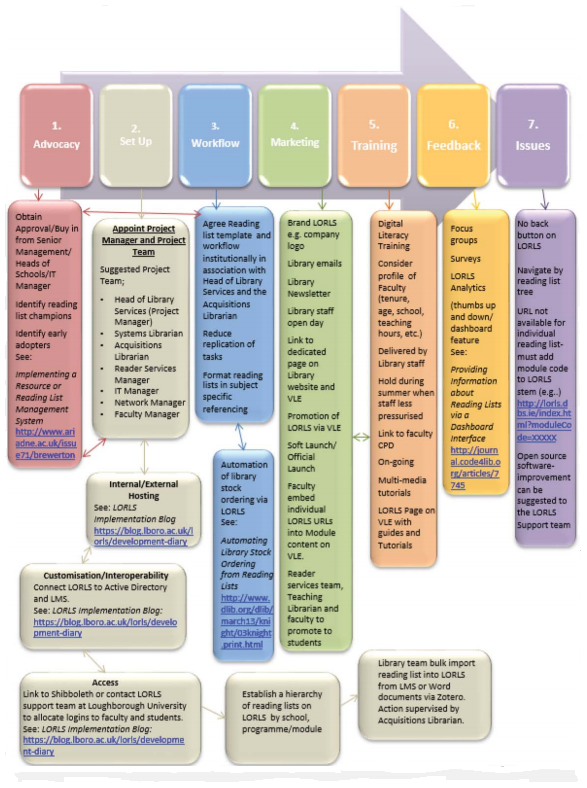 Pump priming the system with academics’ existing (often Word based) reading lists can be a real winner – once a list is on the system is much easier to get academics to update it or at least be aware if they haven’t so you can then nag them about it! It’s important to know the lie of the land – what may work with one department won’t necessary work with another. For example Engineers have a very different approach to reading lists than Social Scientists. Use every opportunity to stress the importance of reading lists to academic departments, for example: bad module feedback, that’s because of your lack of reading lists on the system; external review approaching, why not invest some time in updating your reading lists to demonstrate clear communication between academics, librarians and students.